OSWEGO – Recognition of student achievement has been at the forefront of 2019 for the Oswego City School District. Superintendent Dr. Dean Goewey said as the district prepares students to become fully prepared and life ready when they graduate from Oswego High School, it is as equally important to honor their successes as they achieve greatness as a Buccaneer. 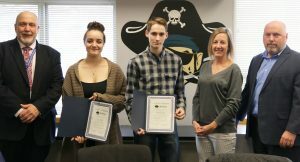 During the April 2 Board of Education meeting, BOE members and Dr. Goewey honored three sets of students for their athletic, artistic and academic accomplishments. Certificates for each of the 15 honorees detailed how their hard work and dedication had brought recognition to them, their teachers, the OCSD and the entire Oswego community. • Sydney DeLapp: for her third season as a girls’ varsity swimmer and a first-year New York State Championship Swim Meet qualifier, the second straight season or being selected for the first-team all-league honors and for being chosen for the All Section 3 Team. • Molly Fitzgibbons: for being a stand-out runner for the Girls Varsity Cross Country Team and for her accomplishments as a first team all-division, first team all-league, seventh-place Section 3 Class A, first team ALL CNY, 19th place in the New York State Public High School Athletic Association Class A State Championship Meet, a member of the NSY Section 3 championship team and fourth-team all-state. • Joshua Thomas: for being a leader on the Boys Varsity Swimming and Diving Team, a qualifier for the Section 3 championship swimming and diving meet in all events, for ranking in the top nine in the 50 freestyle and 100 butterfly and top four in the 100 freestyle in Section 3.